By Dario Marianelli and Pride & Prejudice (Movie). This edition: Interactive Download. Film/TV, Love. 5 pages. 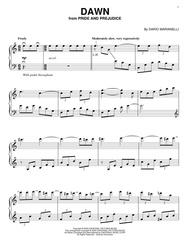 Published by Hal Leonard - Digital Sheet Music (HX.26233). hand. Will be confusing for beginner players, but if you have experience playing and reading music, you can sift through the arrangement. January 03, 2017 "Dawn" is a nice movie mood setter. This is a lovely piece. I wanted to learn this piece after having seen the movie "Pride and Prejudice." 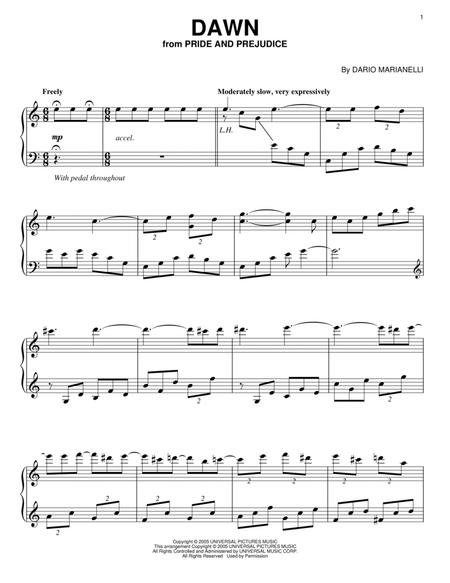 I'm so glad it was available for instant download at Sheet Music Plus.